The loading speed of your Shopify website is extremely important. You want it to be fast, or faster than all of your competitors. That’s why it’s time we talk about the importance of website speed optimization. Nobody has time to sit around and wait four seconds for a page to load. Are you serious? It’s the future. People expect things to load instantly, every time and everywhere. Are you losing money because your Shopify store loads slow? With a slow loading ​website, you most definitely are. So in this blog post I’ll share with you some big takeaways for optimizing your website speed, including tips that you can put into action for immediate results. Enough of the fluff, let’s get into it. Why Does Shopify Website Speed Matter? This blog post is also available in video form. Click ‘Play’ below to start watching! Make sure to subscribe to our YouTube Channel for weekly updates and insights! The first thing to talk about is why even bother with the loading time of your Shopify store? Why spend the time reading this guide, then implementing what I'm about to share? Honestly it's pretty simple. Learn how my students are earning $300 or more per sale every day... without needing inventory or existing marketing experience! First reason to why website speed matters is because Google loves fast pages. If you're trying to get organic traffic (aka FREE traffic) there's a lot of different things you can do on the content side. However, if you’re wanting to rank, page speed is necessary. It doesn’t matter how great your content is, if it’s not comparable to the top 10 results, then guess what? It’s not going to be there. Bottom line: if you want great organic traffic your site has to be fast. So why does Google love fast pages? It's because people that visit them don't bounce. ​You’re probably familiar with the term bounce rate if you’ve been in online business for anytime. Bounce rate is the percentage of visitors to a particular website who navigate away from the site after viewing only one page. A high percentage bounce rate is a sure sign that your homepage is slow and/or irrelevant. At the end of the day, Google wants to send visitors to relevant pages. Google knows they’re doing good when they send visitors to a website, and the visitors stay on that website. If they stay on the website, it means Google sent them to the right place. ​Google Loves Fast Pages Because People Don’t Bounce! Google wins when they send visitors to relevant pages. They know pages are relevant when people stay on them. You can have the best content in the world, but if your site is slow, Google will not reward you with traffic. And yes Google tracks all of this. They don't just send clicks and then hope it worked. They know what's happening when someone gets to your site. Their algorithm figures out what pages are relevant so the visitors they send to those pages stay on them. Meaning, it’s very important to know that if your website is slow, Google will not reward you with visitors. Doesn’t matter if you’re the best at marketing or have the best content, if your Shopify website is slow, visitors will leave your website before they even have a chance to see it and to experience it. 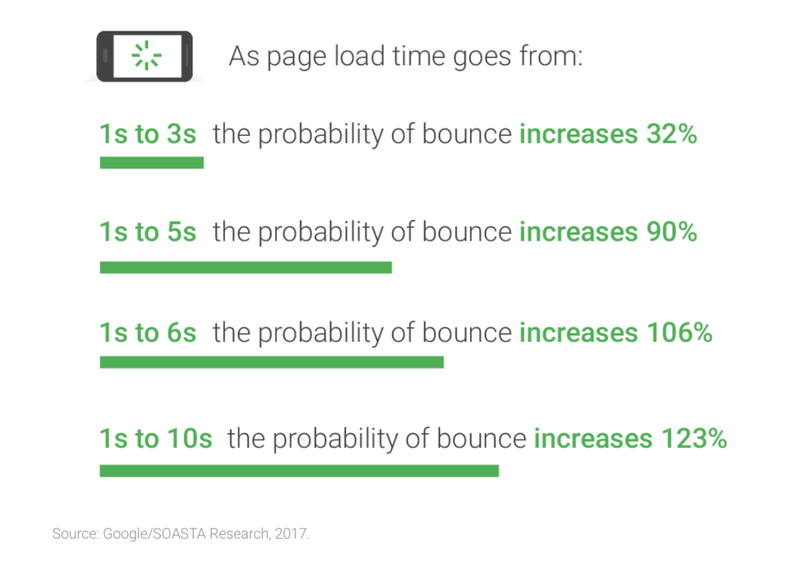 Here’s an image that shows Google’s data on the subject and how the probability of bounce increases as page load time increases. Download the full report here. So you could think of this a few ways, right? Obviously Google wants to send people that stick, which is great for them. Of course, that's also good for us. Regardless of how visitors are finding us, if we can give them what they're looking for fast, then this data above still holds true. They won't bounce. Which means we actually have a chance of converting them into a customer. Shopify page speed is extremely important on both the organic side and the conversion rate side. ​The fact that your website loads fast on your fiber internet connection or while you’re connected to LTE on your phone is not good enough. You need to be as fast, or faster, than the competition if you want to rank organically. By optimizing your Shopify website speed, you're going to get the added benefit of people that come from any traffic source sticking on your site longer. That’s because they will see what they want and as soon as they get to your site. Search for a keyword you want. Open the top 10 organic results. Check all the page speeds (using tools mentioned below) to see how they compare. There are a ton of different tools out there to check your site speed, many of which are free. For us, we use two different tools to test two different things: desktop and mobile. First I'm going to explain how to check your site speed on desktop, and then I'm going to do the same with mobile. ​​​To watch the walk-through of this, just click play on the video below. Now again what do you with this info, right? What do you do when you find that your site is already better than everybody? What do you do if you find that your site is just dramatically slower? Either way, you should always focus on optimizing your Shopify site speed. Why? Because you want to be fast one out there– while not stripping everything out of your site. If you run these tests for yourself and again you notice that your site is below average or just not as fast as you think it could be. Here are some quick tips for Shopify speed optimization that you can put into action right away. It’s the 80/20 concept of website speed optimization. Meaning, these few tips could drastically increase how fast your website pages load. Which means more traffic, and increasing the chances of having visitors on your Shopify site buy. So the first tip I can give you on how to speed up a website, is to use a fast theme. If you use Shopify, you know they have a theme store with plenty of free, paid, and build your themes. The thing is, there are some high quality themes, and there are many that are not. As far as recommendations for fast loading Shopify themes, our top pick is of course our Drop Ship Lifestyle ​theme. It’s exclusive for our members and I know it’s fast because it was built for speed. Another company that I would highly recommend is called Out of the Sandbox. They have a bunch of great themes that are also built to load fast. They are pricey, but it’s a long term investment in your business that is well worth it. Explore their selection of Shopify themes here. Now the reason it's so important to get one of these fast-loading themes is because when it comes to software and technology there is a term in the computer science space that applies, “Garbage in, garbage out”. It holds true to any type of platform that you build on. Shopify gives you the base with their platform. Then it’s up to you to control what you want it to look like through a theme. The theme is the foundation of your Shopify store. If you get a great theme with perfect coding and no bloat, you’re going to have great results. But on the other hand, if you install some random theme that someone with no idea how to code create, you’re putting garbage in your site. Which means you’re going to get garbage out of it. Shopify as a stand alone thing is excellent and it's lightning fast, but you gotta give it a good theme or else you're going to get terrible results. Another thing with this whole garbage in, garbage out mentality is the other stuff you add once you build your store. A big one are apps. One of our favorite things about Shopify is their app store. (Check out the list of our top 20 favorite apps here.) We’re always trying new ones, there seems to be no end of the awesome new apps released pretty much every day. But the key is to make sure to remove the ones that don’t work. With Shopify, you 100% want to take advantage of the apps. A lot of them will them help you with conversion rates, customer satisfaction and all the important details. However, you should only keep what is getting results. Take a look at your apps. Are you using them all? Are the ones you’re using actually beneficial to your business? If the answer is no to either of those questions, delete them. Now, there’s another important aspect to this website speed optimization tip. Once you’ve clicked ‘Uninstall’ and removed the app, it’s not totally gone. The way that most apps work, is when you one-click install them on your website that app is taking their code and they're adding it to your code on Shopify. Without getting too technical, what they're doing is basically injecting their code into your website to get their app to work. Now when you uninstall the app it doesn't strip that code, that code they put there still lives on, a lot of it does. And if the app is slowing down your website you have to have that code removed. When you uninstall apps make sure everything is removed. ​​Having extra bloat in your code will slow down your ​Shopify store. All the big apps have documentation on how to do this so you usually don't have to even email anybody. ​Every app in the Shopify App Store has ​the above section of support details on their page. Next tip on improving page load speed is to optimize your media files. This includes images, PDFs, and any form of media you have in your Shopify store. When you get your images from a supplier or stock image website, most times they are going to be these massive 6000x4000, 20 megabyte pictures. And guess what? You don’t need images anywhere near that size. Those massive media files also take forever to load. The good news is that it's easy to take high resolution images and make them smaller. Then you can compress them to load faster while not losing any quality. There are plenty of Shopify apps that can do this for you. You can also use a free tool like TinyPNG that allows you to upload your files, your media files, PNG images, and JPEGs, and what it will do is make them smaller files. ​Shopify’s own recommendations are 2048 x 2048px. While this is the recommendation, the platform does support product images up to 4472 x 4472 ​pixel. Try to keep file size for simple product images under 1024x1024 and smaller than 500KB. The next tip for optimizing the speed of your Shopify store is to use Google Tag Manager. This allows you to control which tags fire on specific pages, along with when they are fired. So the more codes you add, the slower your Shopify website will load. That’s because it has to wait for one code to load, before the next one can start, and so on. Eventually, you just have all this ‘stuff’ loading that slows down your site. I know this might sound a little advanced if you’re not at this point yet.. So let's just say for example, you're using a marketing tool that gives you a line of code and you only want it to load on your product collection for blue sweaters. With Google Tag Manager, you can easily tell Google to only load this code on that specific product page. What that does is saves your website the extra load time on all these other pages. With this tool you control what tags are fired, on what pages, and when they are fired. Another benefit of using Google Tag Manager, is that all of your tags are stored in one place. Now you can have them appear all at once without waiting for other tags to fire. ​Do NOT include tags for Classic Google Analytics for Google Analytics, Universal Analytics for Google Analytics, or Facebook Pixel. Add these tags them natively through Shopify. Finally, this is page speed tip is worth talking about if you’re already getting great organic results and want to take it to the next level. And that is to implement accelerated mobile pages, AMP for short. AMP is an initiative recently created by Google to speed up the mobile web. 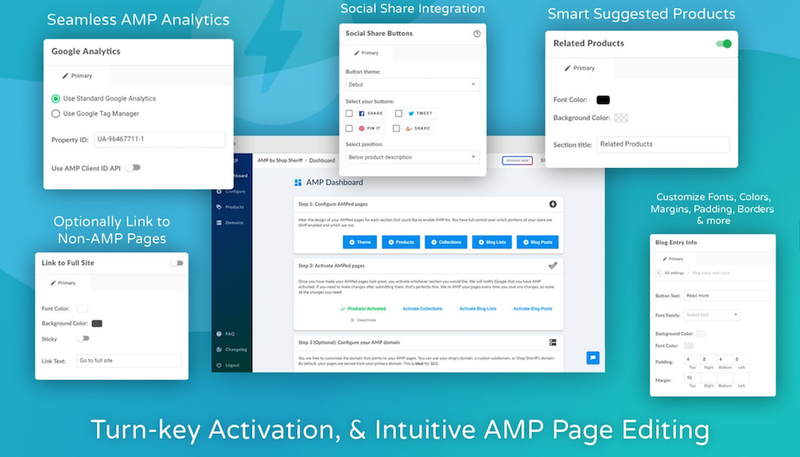 This app converts parts of your Shopify store to AMP, and indexes your pages with Google for nearly instant load times, faster mobile page speed, and higher mobile search results. This is not something you cannot do natively in Shopify. You'll have to use an app if you want to do this in your store. We recommend Shop Sheriff. You can learn more ​about AMP by Shop Sheriff on ​their website here. It is paid and you will have to do some things on your end. But it's worth it for that extra boost for people that are already almost at the top and looking just to smash through and be number one and use this tool to get there. Again, this is not necessary when first starting out. As it will require some work and time on our side. You won’t want to do this unless you are focusing on being the top in your niche in terms of speed. Check the site speed of your top competitors to see where you should be. Don’t forget to optimize for speed on mobile using the free tool from Google. When you’re ready to take things up to the next level in terms of page speed, look into implementing Accelerated Mobile Pages. 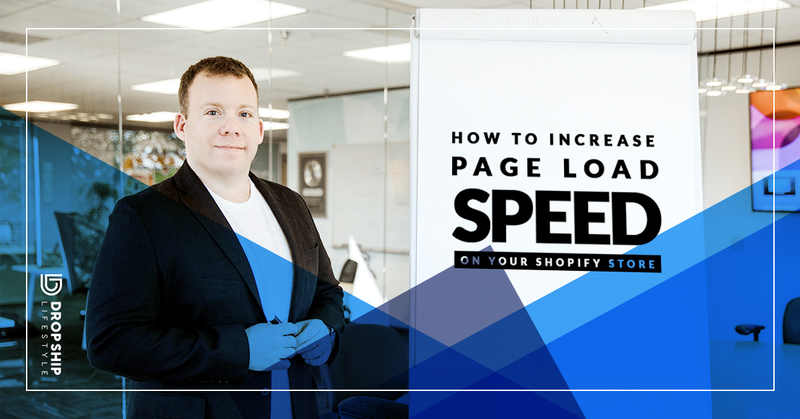 ​So that's my top five tips for how to increase and optimize your ​Shopify website speed. ​These easy tips should work for every single person ​reading this ​right now. If you're reading this and want some additional training, then you​ definitely need go check out my webinar. In this ​free​​​​ training, I go deep into ​much of what we've been talking about on our dropshipping blog, including how to find products, how to get suppliers, and how to set up your website​. I told you it was free and you're still here... what are you waiting for? ​​Join us for a class today! Dropshipping Startup Costs: How Much Money Does It Take to Get Started? Anton is a the Founder & CEO of Drop Ship Lifestyle - an online coaching program for eCommerce entrepreneurs. He began selling online in 2007 and has built and sold multiple seven-figure businesses while leveraging the power of drop shipping. As many of you already know I created Drop Ship Lifestyle after selling a network of eCommerce stores and then trying to find a community of other store owners to network with… What I found was a bunch of scammers who promised newbies they would get rich quick by following their push-button systems! This lead me to create a new community along with an online training program that shares how to build a REAL online business. I’d love to hear what you think… it’s a 2.5-hour training designed to help you drop ship profitably… all for free. Be sure to click here to check it out and send me your feedback! If you go through the “How To Start & Grow A Hyper-Profitable Online Store” webinar and still have questions just contact me and I will help you out.